With the focus on International Earth Day this week and Independence Day today for my fellow Rainbow Nation comrades, the earth, the land and our place on it have been recurring themes now. “Freedom Day” is the actual label for today’s public holiday, the day we celebrate our freedom gained 22 years ago from the oppression of a colonial regime that kept us enslaved and in relative ignorance sometimes at the barrel of a gun. The earth and our right to live on it, grow our own food on it and subsist on it were severely restricted 22 years ago when the flag had only three stripes on it, the stripes of the former colonising country. But since liberation, every native has been constitutionally empowered to claim his or her freedom to acquire a piece of land, grow their own food, raise their own cattle and collect their own water. After all, the secret to a successful life, for the entire nation, on the levels where it really counts, is “simple living and high thinking”. A life lived on the land and in harmony with the land enables everyone to support themselves in the most healthy way with dignity and in sympathetic resonance with Mother Earth. Self-sufficient and self-sustaining decentralised small communities are the secret to future survival on Mother Earth. Never before has the mantra “simple living and high thinking” been more crucial, pertinent and timely than today. Mother Earth and our own nation are under the grips of one of the harshest droughts in modern history. And that means literally and figuratively. Literally dams are drying up, underground water is falling and food shortage is forcing entire countries to beg for emergency aid from the same foreign powers “Freedom Day” supposedly saved them from. Figuratively the global economy is in such a recession that traditional jobs have dwindled, fiat currency is devaluing daily and we are even worse off now than at the time of the 2008 global financial collapse. By returning to the land, investing in Permaculture farming, establishing cow protection and engaging everyone according to their nature, a community can save itself from approaching devastation. There may come a time when money becomes worthless, or food vanishes, along with municipal water and power. Then small farming communities become the source of survival and sustenance, as it was originally meant to be. 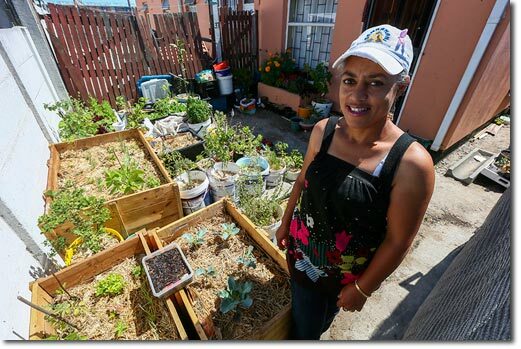 And you would think that in the Rainbow Nation, the government who has liberated us from oppression would empower us by facilitating just such community self-sufficiency. Yet try to catch your own rain water in a tank from your roof and you will find out that there are now laws in place that prevent you from doing just that in some places, or heavily tax you according to how much you catch. In some countries you can’t even legally cultivate your own personal organic food crop any more. Or in our own nation compatriots, teaching Permaculture skills at schools in my area has been stopped in all but the Waldorf school. Stopped by the government. A friend nearby, who once made his millions in business and sailed his own yacht in the Med, retired from the rat race and mastered Permaculture living to the point that he was freely teaching up to 8 different local schools those very same essential survival skills, but was forced to back off and desist. The government did not want him to teach others how to be self-empowered, self-sufficient and truly liberated individuals. And try to go off the grid nowadays. Even there the government makes it difficult and in some places impossible to build your home without being linked up to their plumbing and their flouridated drinking water supply. In other words the government do not actually want you to have your freedom today. They want you on their system so that they can keep you in their tax base, under their influence and disempowered to liberate yourself still further. There is no real freedom from the elite, the system, the coloniser of your very mind. Even those trying to form their own self-sufficient farm community on private land, with compost toilets, rain tanks, organic food gardens and cows, are being fined, arrested or intimidated to desist. This has been going on since Tesla, the greatest genius of the last 200 years. Just over 100 years ago he discovered that there was unlimited free energy available that could be tapped by every person wherever they are, without cables. He tapped into and channelled the positive charge of the upper atmosphere, combined with the negative charge of the geosphere (Mother Earth) and harnessed what could be called the Yin and Yang energies for all to tap. But his financier, one of the original global elitists, saw that he could make no money off this giving of free energy to the masses, so he shifted his funding to Edison and the light bulb was born, with all its miles and miles of copper wire. The rest is history, but the same applies today when Mother Earth is at an ecological and humanitarian crisis of drought and food scarcity, and yet the government (and their backers, big corporations) would rather keep us dependent on their billable systems that waste precious water, keep us disempowered and dumbed down with the illusion of freedom so that the income gap grows instead of shrinks, and the 1% wallow in ill-gotten riches. You are not free to gain self-sufficiency. You are not allowed to teach others how to really free themselves from the oppressive system. Freedom Day is a big lie compatriots. You are not even free to go out distributing free food to the poor in their homes. I have case studies again of government concern at being seen as lacking, when handouts are supplied by someone other than them, whether here in Rainbowland or in that other “land of the free”. To the man on the ground it seems that the system is back to front, and it is so for a purpose, namely the corporation over the citizen. Those with the biggest guns control the resources and not even your vote counts in a rigged system. Unless we wake up from this illusion of so-called freedom, we and Mother Earth, Bhumi Devi, will be exploitable and disposable, like every other commodity. So this is what our generation was born for. Our time has come to remember our power, remember the source of our power – heaven and earth – and shake off our ignorance by becoming informed, armed with the sword of knowledge, so that we can defend not only ourselves as a community but also our Mother Earth and the cows who are being exploited to such a degree that, unless we take a stand, it’s all over for Her and us. After all, Her resonance is our resonance. Tesla’s discoveries were taken further by German physicist Prof Schumann in the 1950’s who eventually labelled the actual 7.8 hz frequency at which the earth vibrates after himself. And it turns out that, at our best, we all vibrate at 7.8 for when relaxed, the alpha rhythm of our brains is 7.8 hz or the “Schumann Resonance”. Modern, non-rural city life has distorted our vibration to the degree that we are out of harmony with Mother Earth, prevented from tapping into the vibration of the stratosphere and geosphere, and thus we have a below optimum immune system and general well-being. This is where simple living on a self-sufficient farm community is literally the secret to the highest thinking, feeding one’s body, mind and soul, as always intended by Mother Earth for Her dependents. 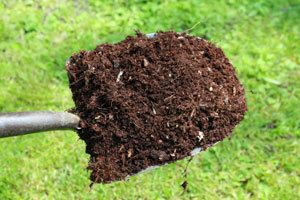 As every gardener knows, one of the key things you need if you are going to grow plants is good soil. 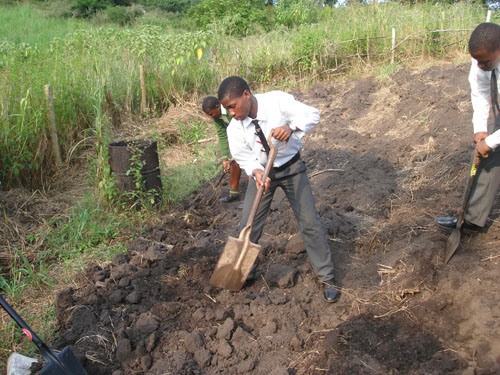 When using permaculture this necessity can sometimes be challenged; for example, in very dry or extreme (very dry/very wet) climates such as Mediterranean, some people recommend using no soil at all but instead growing all of your plants in gravel or small pebbles. This technique, suggested by for example Hemenway (1), is known as xeriscaping and might be worth a try if your garden is particularly prone to drought. On the other end of the spectrum, aquaculture is a technique that involves one’s crops being entirely submerged in water, which has been used for centuries in Asia and whose modern proponents include Christenson (2015) (2). We are SEED, a 12 year old non-profit and Public Benefits Organisation that has been pioneering the growing of outdoor classrooms in under-resourced schools across South Africa. Learn more about our work via this video. Through the important work of connecting children to the ecosystems that support them, and bringing the miracle of food into curriculum and tummies of children, we have found that our work addresses climate change, job creation and career pathing, social cohesion and food security. Watch the video and be inspired. I suspect that if many of our schools had been incorporating this kind of permaculture education over the last few decades, the world would today be in a far better situation, as many of the adults and young adults of the present generation would now already be eco-literate doers and changers.